England fans have predicted that Gareth Southgate’s Three Lions will bow out of the 2018 World Cup in Russia at the quarter-final stage. But those supporters are dreaming of a prize far bigger than the World Cup itself… a cool £100million courtesy of BetStars. 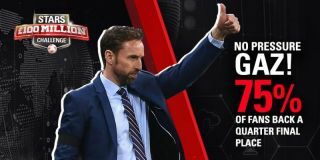 A massive 77.5% of fans who have placed their early predictions on the Stars £100m Challenge have backed England to reach the last eight in Russia, but only 7.44% believe Harry Kane and Co will lift the trophy on July 15. Fans were asked to predict the result of all 64 matches at this summer’s tournament for the chance to win up to £100m. You can also take part by visiting starschallenge.betstars.uk/. As well as providing a shot at mega money, the Stars £100m Challenge is a great way of plotting out England and their rivals’ possible route to glory in Russia. You start the game by predicting – simply win, lose or draw (no correct scores needed) – the outcomes of the 48 group matches. Once you have made these predictions, you are shown how the knockout phase would look based on those results and the World Cup draw. I played the game and found myself among the majority of fans tipping England for a quarter-final exit – those pesky Germans! – with Argentina going on to beat Brazil in the final. BetStars are offering a meaty 9/1 on Argentina winning the trophy, while Brazil are 4/1 favourites. Germany (19/4) Spain (6/1) and France (13/2) are also among the main contenders. England’s problem is that they look destined to face a giant in the last eight, with Brazil or Germany their most likely quarter-final opponents. Despite their tough draw, just over 10% of fans are backing England to reach the final. If England are to go deep in Russia, much will be needed from captain Kane. The Tottenham striker is the even-money favourite to be England’s leading scorer in the tournament. Participants need to visit starschallenge.betstars.com to enter the Stars £100 Million Challenge. The total amount of £100m will be made in one payment to any customer (or shared between joint-winners) if 64 correct match results (win, lose or draw) are predicted. All participants have one free entry, but can acquire additional entries by completing one or more different challenges across The Stars Group’s brands. The Stars £100 Million Challenge is available in the United Kingdom, Denmark, Norway, Finland and Sweden. Prediction selections must be made before 23:59 (UK time) on June 13, ahead of the opening match between Russia and Saudi Arabia. Betting strategies you must follow in this World Cup to win big!